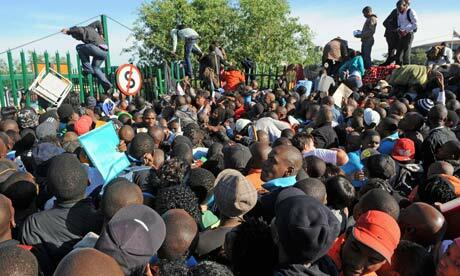 Eight thousand people queued for access to a narrow gate at the University of Johannesburg in January 2012. The line was three-kilometers long. The writing was on the wall; however, applications exceeded positions by six or seven times. When the gate opened, the crowd moved forward. A waiting mother who had accompanied her son to the campus was crushed underfoot. Her son had made it through the gate and was registering, unaware. Witnesses reported a lot of screaming and pushing. When the gate broke, people tried to climb over the fence. Hours later, shoes and camping chairs littered the ground. Even after all of that, people were still standing in line hoping to register. This entry was posted in Uncategorized and tagged acceptance, application to university, campus, crushed underfoot, gates, Geoffrey York, Johannesburg, legacy of apartheid, line ups, metaphorical access, mother killed, narrow gate, non-acceptance, queues, shoes, social access, South Africa, South Africa’s education system, South African government, stampede, tragedy, University of Johannesburg, university registration. Bookmark the permalink.